Examples of objects that can be produced on a lathe include screws, candlesticks, gun barrels, cue sticks, table legs, bowls, baseball bats, musical instruments (especially woodwind instruments), crankshafts and much more. A screw is a type of fastener, in some ways similar to a bolt, typically made of metal, and characterized by a helical ridge, known as a male thread. Screws are used to fasten materials by digging in and wedging into a material when turned, while the thread cuts grooves in the fastened material that may help pull fastened materials together and prevent pull-out. 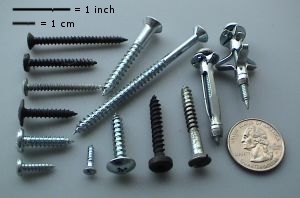 There are many screws for a variety of materials; those commonly fastened by screws include wood, sheet metal, and plastic. A candlestick, chamberstick, or candelabrum is a device used to hold a candle in place. A gun barrel is a crucial part of gun-type ranged weapons such as small firearms, artillery pieces and air guns. It is the straight shooting tube, usually made of rigid high-strength metal, through which a contained rapid expansion of high-pressure gas(es) is introduced behind a projectile in order to propel it out of the front end (muzzle) at a high velocity. The hollow interior of the barrel is called the bore. The measurement of the diameter of the bore is called the caliber. Caliber is usually measured in inches or millimetres. The Etruscan civilization is the modern name given to a powerful and wealthy civilization of ancient Italy in the area corresponding roughly to Tuscany, south of the Arno river, western Umbria, northern and central Lazio, with offshoots also to the north in the Po Valley, in the current Emilia-Romagna, south-eastern Lombardy and southern Veneto, and to the south, in some areas of Campania. As distinguished by its unique language, this civilization endured from before the time of the earliest Etruscan inscriptions until its assimilation into the Roman Republic, beginning in the late 4th century BC with the Roman–Etruscan Wars. The Warring States period was an era in ancient Chinese history characterized by warfare, as well as bureaucratic and military reforms and consolidation. 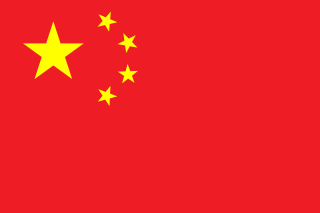 It followed the Spring and Autumn period and concluded with the Qin wars of conquest that saw the annexation of all other contender states, which ultimately led to the Qin state's victory in 221 BC as the first unified Chinese empire, known as the Qin dynasty. The lathe was very important to the Industrial Revolution. It is known as the mother of machine tools, as it was the first machine tool that led to the invention of other machine tools. The first fully documented, all-metal slide rest lathe was invented by Jacques de Vaucanson around 1751. It was described in the Encyclopédie. An important early lathe in the UK was the horizontal boring machine that was installed in 1772 in the Royal Arsenal in Woolwich. It was horse-powered and allowed for the production of much more accurate and stronger cannon used with success in the American Revolutionary War in the late 18th century. One of the key characteristics of this machine was that the workpiece was turning as opposed to the tool, making it technically a lathe. Henry Maudslay who later developed many improvements to the lathe worked at the Royal Arsenal from 1783 being exposed to this machine in the Verbruggen workshop. A detailed description of Vaucanson's lathe was published decades before Maudslay perfected his version. It is likely that Maudslay was not aware of Vaucanson's work, since his first versions of the slide rest had many errors that were not present in the Vaucanson lathe. A lathe may or may not have legs also known as a nugget, which sit on the floor and elevate the lathe bed to a working height. A lathe may be small and sit on a workbench or table, not requiring a stand. Smaller metalworking lathes that are larger than jewelers' lathes and can sit on a bench or table, but offer such features as tool holders and a screw-cutting gear train are called hobby lathes, and larger versions, "bench lathes" - this term also commonly applied to a special type of high-precision lathe used by toolmakers for one-off jobs  . Even larger lathes offering similar features for producing or modifying individual parts are called "engine lathes". Lathes of these types do not have additional integral features for repetitive production, but rather are used for individual part production or modification as the primary role. Water-powered Blanchard lathe used for duplicating gun stocks from 1850's. Harpers Ferry Armory. Transcription or recording lathes are used to make grooves on a surface for recording sounds. These were used in creating sound grooves on wax cylinders and then on flat recording discs originally also made of wax, but later as lacquers on a substrata. Originally the cutting lathes were driven by sound vibrations through a horn in a process known as Acoustic recording and later driven by an electric current when microphones were first used in sound recording. Many such lathes were professional models, but others were developed for home recording and were common before the advent of home tape recording. Lathes for making gun barrels, Naval Gun Factory, Washington, D.C. The phrase speeds and feeds or feeds and speeds refers to two separate velocities in machine tool practice, cutting speed and feed rate. 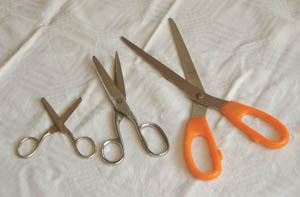 They are often considered as a pair because of their combined effect on the cutting process. Each, however, can also be considered and analyzed in its own right. A chuck is a specialized type of clamp used to hold an object with radial symmetry, especially a cylinder. In drills and mills it holds the rotating tool whereas in lathes it holds the rotating workpiece. On a lathe the chuck is mounted on the spindle which rotates within the headstock. For some purposes an additional chuck may be mounted on the non-rotating tailstock. Spindle turning, or turning between centers, is a woodturning method referring to a piece of wood on a wood lathe that is being turned on its center axis. A lathe center, often shortened to center, is a tool that has been ground to a point to accurately position a workpiece on an axis. They usually have an included angle of 60°, but in heavy machining situations an angle of 75° is used. A metal lathe or metalworking lathe is a large class of lathes designed for precisely machining relatively hard materials. They were originally designed to machine metals; however, with the advent of plastics and other materials, and with their inherent versatility, they are used in a wide range of applications, and a broad range of materials. In machining jargon, where the larger context is already understood, they are usually simply called lathes, or else referred to by more-specific subtype names. These rigid machine tools remove material from a rotating workpiece via the movements of various cutting tools, such as tool bits and drill bits. An indexing head, also known as a dividing head or spiral head, is a specialized tool that allows a workpiece to be circularly indexed; that is, easily and precisely rotated to preset angles or circular divisions. Indexing heads are usually used on the tables of milling machines, but may be used on many other machine tools including drill presses, grinders, and boring machines. Common jobs for a dividing head include machining the flutes of a milling cutter, cutting the teeth of a gear, milling curved slots, or drilling a bolt hole circle around the circumference of a part. In machining, boring is the process of enlarging a hole that has already been drilled by means of a single-point cutting tool, such as in boring a gun barrel or an engine cylinder. Boring is used to achieve greater accuracy of the diameter of a hole, and can be used to cut a tapered hole. Boring can be viewed as the internal-diameter counterpart to turning, which cuts external diameters. 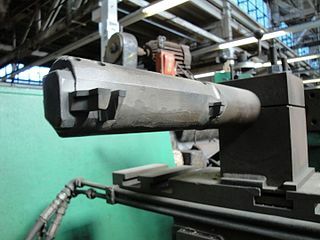 The turret lathe is a form of metalworking lathe that is used for repetitive production of duplicate parts, which by the nature of their cutting process are usually interchangeable. It evolved from earlier lathes with the addition of the turret, which is an indexable toolholder that allows multiple cutting operations to be performed, each with a different cutting tool, in easy, rapid succession, with no need for the operator to perform set-up tasks in between, such as installing or uninstalling tools, nor to control the toolpath. The latter is due to the toolpath's being controlled by the machine, either in jig-like fashion, via the mechanical limits placed on it by the turret's slide and stops, or via electronically-directed servomechanisms for computer numerical control lathes. A screw-cutting lathe is a machine capable of cutting very accurate screw threads via single-point screw-cutting, which is the process of guiding the linear motion of the tool bit in a precisely known ratio to the rotating motion of the workpiece. This is accomplished by gearing the leadscrew to the spindle with a certain gear ratio for each thread pitch. Every degree of spindle rotation is matched by a certain distance of linear tool travel, depending on the desired thread pitch. In machine tools, a spindle is a rotating axis of the machine, which often has a shaft at its heart. The shaft itself is called a spindle, but also, in shop-floor practice, the word often is used metonymically to refer to the entire rotary unit, including not only the shaft itself, but its bearings and anything attached to it. Threading is the process of creating a screw thread. More screw threads are produced each year than any other machine element. There are many methods of generating threads, including subtractive methods ; deformative or transformative methods ; additive methods ; or combinations thereof. An automatic lathe is a lathe whose actions are controlled automatically. Although all electronically controlled (CNC) lathes are automatic, they are usually not called by that name, as explained under "General nomenclature". The first kinds of automatic lathes were mechanically automated ones, from the 1870s until the advent of NC and CNC in the 1950s and 1960s. CNC has not yet entirely displaced mechanically automated machines. The latter type of machine tool is no longer being newly built, but many existing examples remain in service. Milling is the process of machining using rotary cutters to remove material by advancing a cutter into a workpiece. This may be done varying direction on one or several axes, cutter head speed, and pressure. Milling covers a wide variety of different operations and machines, on scales from small individual parts to large, heavy-duty gang milling operations. It is one of the most commonly used processes for machining custom parts to precise tolerances. 1 2 "What is a wood lathe & How to use it?". ↑ Clifford, Brian. "A brief history of woodturning". The Woodturner's Workshop. Woodturners' Guild of Ontario. Retrieved 2018-07-24. The earliest piece from that [Northern Italy] was found at a site known as the "Tomb of the Warrior" at Corneto. This is a fragment of a wooden bowl, dated at around 700 BC, which shows "clear evidence of rounding and polishing on its outer surface and of hollow turning..." (Woodbury) Other Etruscan turned vessels were found on this site. ... Excavations of a mound grave in Asia Minor (now Turkey) revealed two flat wooden dishes with decorative turned rims. These have been dated as from the 7th century BC. ↑ Emperor's Ghost Army (documentary). PBS. Event occurs at 26:00. Archived from the original on 2016-01-15. ↑ Clifford, Brian. "A brief history of woodturning". The Woodturner's Workshop. Woodturners' Guild of Ontario. Retrieved 2018-07-24. The earliest information on the lathe dates from the 3rd century BC. This is a bas-relief carving on the wall of the grave of an Egyptian called Petrosiris. ↑ Murthy, S. Trymbaka. Textbook of Elements of Mechanical Engineering. ISBN 978-9380578576. ↑ Tomiyama, Testuo (2016-02-16). "Development of Production Technology and Machine Tools (presentation notes)" (PDF). OpenCourseWare: TUDelft. TUDelft. pp. 18–21. Archived (PDF) from the original on 2018-07-25. Retrieved 2018-07-24. 1770 Jan Verbruggen Escaped to England with his Son Pieter Verbruggen (1734-1786) and Became Master Founder at Woolwich Arsenal Tomiyama, Testuo (2011). 02. Ontwikkeling Fabricagetechnologie [02. Development of Manufacturing Technology] (Lecture). Delft, Netherlands: TUDelft. ↑ Ruttan, Howard. "Wait a minute..." Archived from the original on 2009-01-08. ↑ "Hints & Tips for Using a Lathe". “George Wilson’s” Hints and Tips - Publication date unknown. Lathes.co.uk. Archived from the original on 1 December 2010. Retrieved 29 November 2010. ↑ Griffiths, Tony. "Makers of "Bench Precision" Lathes". LATHES.CO.UK. Archived from the original on 27 December 2017. Retrieved 5 February 2018. ↑ Parker, Dana T. Building Victory: Aircraft Manufacturing in the Los Angeles Area in World War II, p. 81, 123, Cypress, CA, 2013. ISBN 978-0-9897906-0-4. ↑ Smith, Merritt Roe (2015). Harpers Ferry Armory and the New Technology: The Challenge of Change. Cornell University Press. ISBN 9780801454394 . Retrieved 30 June 2016. ↑ "Methods for Performance Evaluation of Computer Numerically Controlled Lathes and Turning Centers". asme.org. The American Society of Mechanical Engineers. Archived from the original on 7 November 2017. Retrieved 5 February 2018. Holtzapffel, Charles (1843–1897). Turning and Mechanical Manipulation Volume V.
Marlow, Frank (2008). Machine Shop Essentials: Q & A. Metal Arts Press. ISBN 978-0-9759963-3-1. Oscar E. Perrigo. Modern American Lathe Practice. A New, Complete and Practical Work on the "king of Machine Shop Tools. ", 1907. Raffan, Richard (2001). Turning Wood With Richard Raffan. Taunton. ISBN 1-56158-417-7. Joshua Rose. The Complete Practical Machinist: Embracing Lathe Work, Vise Work, Drills, etc., Philadelphia: H.C. Baird & Co., 1876; 2nd ed. 1885. Sparey, Lawrence (1947). The Amateur's Lathe. Special Interest Model Books. ISBN 0-85242-288-1. Woodbury, Robert S, (1961). History of the Lathe to 1850. Cleveland, Ohio: Society for the History of Technology. ISBN 978-0-262-73004-4. Bray, Stan (2004). The compact lathe (2nd rev. ed.). Poole: Special Interest Model Books. ISBN 1854862278. OCLC 63184337. Wikimedia Commons has media related to Lathes . The history of the lathe at Archive.today (archived 2012-12-23). Additional archives: 2016-12-01 . Modern Machine Shop Practice a historic Victorian text describing lathe design, construction and use in 1880s. The South Bend Lathe Library Make Magazine, November 16, 2011. Links to How to Run a Lathe and other publications by South Bend Lathe Works. "The Forgotten Power Tool." Popular Science, December 1959, pp. 149–152. "Disc Cutting and Recording Lathes." http://www.aes.org/aeshc/docs/recording.technology.history/lathe.html.